This is a special Summer customization project: what if flip-flops were to become the lastest fashion must-have accessory that would match your favorite Summer outfit? Follow this very easy design to fix beads and a Swarovski crystal cabochon, together with metal beads, onto your flip-flop straps. 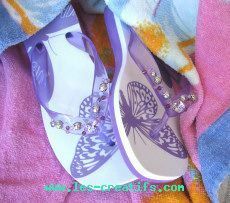 The aim of customizing is obviously to come up with a pair of flip-flops that you'll enjoy wearing. Therefore, neither the threads nor the beads should make your flip-flops uncomfortable to wear. You shouldn't be able to feel them at all. Beads should be securely fixed in place so they don't move as you walk. - 2 x 12mm Crystallized™ Swarovski® Fancy Stone (4470) : Violet with their silvered settings - 4 x 8mm Swarovski Crystal pearls (5800) Mauve + 8 silvered caps - 4 x 5mm Swarovski Crystal pearls (5800) Mauve - 12 x 4mm Swarovski bicone beads : Violet - 4 x 4mm Swarovski bicone beads : Violet Opal - 12 x 4 mm czech crystal faceted beads : Amethyst - 12 x 4 mm czech crystal faceted beads : Pink - 4 x 8mm metallic Bali beads - 2 x 36 inches of thread (diameter 0.25mm) - some needle twisted wire will be very useful to help the thread going through the holes you'll make. 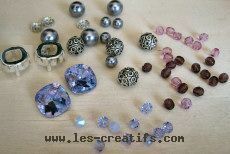 You can choose to buy all theses beads here (with 3 needles and a pattern with picture and text in french) : just add it in your cart then go into our english bead store to finish your order. 2 x 12mm Crystallized™ Swarovski® Fancy Stone (4470) : Violet with their silvered settings - 4 x 8mm Swarovski Crystal pearls (5800) Mauve + 8 silvered caps - 4 x 5mm Swarovski Crystal pearls (5800) Mauve - 12 x 4mm Swarovski bicone beads : Violet - 4 x 4mm Swarovski bicone beads : Violet Opal - 12 x 4 mm czech crystal faceted beads : Amethyst - 12 x 4 mm czech crystal faceted beads : Pink - 4 x 8mm metallic Bali beads - 2 x 36 inches of thread (diameter 0.25mm) - some needle twisted wire will be very useful to help the thread going through the holes you'll make. You can choose to buy all theses beads here (with 3 needles and a pattern with picture and text in french) : just add it in your cart then go into our english bead store to finish your order. 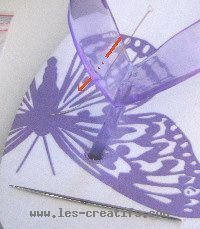 To be able to thread the thread, you will have to make holes in the flip-flop straps, using an embroidery needle which needs to be sharp and of a reasonable diameter. The holes are made midway across the width of the strap. The first hole should be made 0.4 inches from the middle of the strap (where the toe plug is attached to the sole) - see red arrow. The second hole is made 0.6 inches from the first, the third hole 0.6 inches from the second. Do likewise (i.e make 3 holes) on the other part of the strap. Thread the thread through the hole furthest from the center (if necessary, use a beading needle). On the end of the thread that's going in the upwards direction, thread on a Violet bicone bead. On the other end, thread on an Amethyst faceted bead. Cross the two ends over in a Fuchsia faceted bead. Pull the thread so that the two ends are the same length and the Amethyst faceted bead is on top of the strap. Thread the 2 threads through a 5mm luster finish bead, then through an 8mm metal bead. One thread "goes down" through the hole, which should be just after where the thread comes out of the metal bead. Thread a Violet Opal bicone bead onto the other thread. Bring the lower thread up round the side and add on a fuchsia faceted bead. Cross the two threads over in an Amethyst faceted bead. The fuchsia faceted bead should be positioned on the edge of the strap. Bring both threads together through a Violet bicone bead, then thread on: a bead cap + an 8mm luster finish bead + a bead cap. A thread will "go down" into the hole. To the other thread, add a Violet bicone bead. Bring the lower thread back up round the side and thread on an Amethyst faceted bead. Cross the two threads over in a Fuchsia faceted bead. Each thread goes through the cabochon which was placed in its setting (by closing its prong fastenings one after the other). The design is created in a symetrical style. Cross over the threads through a Fuchsia faceted bead. To the thread going towards the outside edge, thread on an Amethyst faceted bead, then thread the thread upwards through the hole. To the other thread, add on a Violet bicone bead. 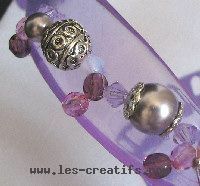 Thread a bead cap onto both threads together, then an 8mm luster finish bead, a bead cap and a Violet bicone bead. Cross the threads over in an Amethyst faceted bead. To the thread going towards the outer edge, thread on a Fuchsia faceted bead, then thread the thread upwards through the hole. To the other thread, thread on a Violet bicone bead. Thread onto both threads an 8mm metal bead and a 5mm luster finish bead. Cross the threads over in a Fuchsia faceted bead. To the thread going towards the outer edge, thread on a Fuchsia faceted bead, then thread the thread upwards through the hole. To finish off, add a Violet bicone bead to this thread. With the 2 threads back together, you will be able to tie a double knot. Before tying the thread in a knot, check that it is tight and that all the beads are positioned on top of the strap. 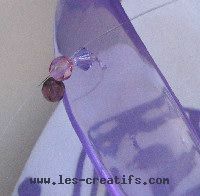 bring the 2 threads through the Fuchsia faceted bead and pull gently, so that the knot jams up against the faceted bead. Cut the threads as close to the knot as possible. Carry out the same steps with the second flip-flop. The same procedure can be carried out using different beads, but keeping to the measurements that are tailored to the position of the holes on the straps.